When it comes to Spider-Man villains, none are more recognizable than Venom, the symbiote responsible for Spider-Man’s iconic black suit. During Spider-Man’s original foray into the movies, directed by Sam Raimi, had Venom featured as a large part of the final movie, Spider-Man 3. This ended up leading to one of the most memorable sequences of the movie, which had Peter, bonded with Venom, dancing (poorly) down the streets of New York. The movie did also feature Eddie Brock, played by Topher Grace, as Venom, who ended up being very by the numbers. So when Sony decided to make a movie universe featuring only Spider-Man villains, they decided to chose the villain turned hero of Venom, this time played by Tom Hardy. So, which version of Venom is better, the original or the new contender? But be warned, this article doesn’t hold back on spoilers for Venom or Spider-Man 3. Both Venoms have the same basic origin, involving a symbiote landing on Earth. However, the way each Venom gets to Eddie Brock is different. Both Eddie Brocks bond with Venom after having their careers ruined. Spider-Man 3 Eddie Brock gets a staff job at the Daily Bugle, but is fired when Peter Parker (bonded with Venom) reveals that Eddie Brock faked the photo he used to get the job. Eddie Brock from Venom loses his career once he questions Carlton Drake, founder of the Life Foundation, on shady business practices. After that both Eddies fuse with Venom unintentionally. In Spider-Man 3, Eddie Brock prays in a church for Peter Parker to be destroyed, coincidentally at the same time Peter pulls off the Venom symbiote in the bell tower, which lands on Eddie Brock, causing him to turn into Venom. In Venom, Eddie investigates the Life foundation to get pictures that both expose their shady business practices, as well as get him his job back. While he’s there he sees a homeless woman he’s befriended, and when he tries to help her, she jumps at him, and the symbiote transfers hosts, causing Eddie Brock to become Venom. While Venom does show up in both movies, he has very different roles between the two. Spider-Man 3 has Venom as the main villain of the movie, mostly because he’s more recognizable than Harry Osborn and Sandman. But during this time as a villain, he doesn’t do much to set himself apart from the previous two villains. Venom is basically just being bad because he likes it, and because he hates Peter Parker. This all culminates in a fight scene where he teams up with Sandman, and uses the same plan as the last two Spider-Man villains, kidnap and threaten Mary Jane. Most of this fight is focused on Sandman, but eventually Venom gets his turn. Spider-Man traps him inside a circle of metal bars, which he hits, which causes the loud sounds to split up Eddie and Venom, and Spider-Man pulls Eddie away from the symbiote. Spider-Man then throws one of Harry’s bombs at Venom. Eddie sees this and jumps into Venom, so both of them end up dying. In Venom, as you can guess by the title, Venom is the main character and the hero, despite what the advertising would led you to believe. Eddie Brock actually works with Venom, because they’re two different characters, to escape the forces of the Life foundation and stop Carlton Drake and Riot from bringing more symbiotes to Earth. Throughout all this Eddie has to learn to work with Venom, try to protect his loved ones, and stay alive throughout all of this. 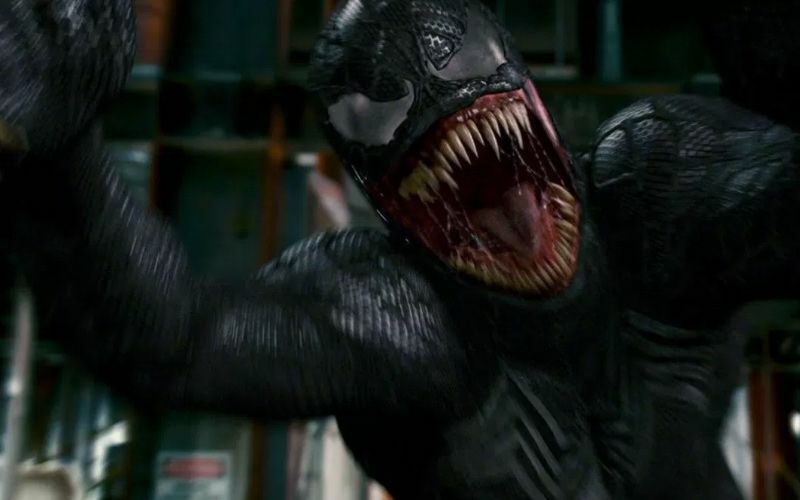 At the end of the movie, after Venom killed Riot and Carlton Drake, Eddie and Venom have come to an agreement about continuing to stop bad guys, even if it involves eating them. Between the way Venom functions in these two movies, it’s easy to spot the biggest difference, Venom is only a character in Venom, not in Spider-Man 3. In the latter, Eddie Brock is the villain, and he’s infected with the Venom symbiote. This is shown by the fact that it’s Topher Grace’s voice you hear, and he almost always reveals his face. The most you get of Venom being his own character is when he screams, and the few seconds he’s separated from a host. However, in Venom, Venom isn’t just a character, he’s the best part of the movie. While Tom Hardy does a decent Eddie Brock, his Venom is great. It’s good to see the goofball tendencies Venom has in the comics brought to the movie. Seeing Venom have to learn the correct way to deal with people can be amusing, and there are just some great moments seeing Venom either take control of Eddie, or work together with him. Plus, Venom has the most funny moments in the movie, and while some aren’t good, such as the now infamous “turd in the wind” line, most end up landing fairly well. The main problem with this Venom is he almost feels like he’s from a pre-MCU movie, when companies were still ashamed of the weirdness of comic books, instead of embracing it. If they fully embraced the weirdness of Venom, the movie could have benefited even more. So, it comes time to decide, which Venom is superior, and it’s obviously the Venom from Venom. Not only does he have a lot more screen time, but he’s actually a separate character than Eddie Brock in a meaningful way. Spider-Man 3 does have a superior Eddie Brock for most of the movie, as he provides a great foil to Peter Parker, up until the point when he bonds with Venom, and becomes bad just because he likes it. Meanwhile, in Venom, Eddie Brock just stumbles his way through the movie, but does get better once he fuses with Venom, as he has to be the symbiote’s guide to the human world. Overall though, the fact that Venom is allowed to not only be his own character, but be a funny and amoral character easily trumps anything that Spider-Man 3 Venom had going for him. While there are a few other things that help the more modern Venom be the best, such as his bulky look or intimidating voice, those were just small factors to the better Venom.